This past Saturday we had our monthly Guild meeting, which happened to be an open sew meeting. I needed something to sew that day...I had nothing in the works...so I invented a new project! I know, it seems ridiculous even to me! But what's a girl to do?! 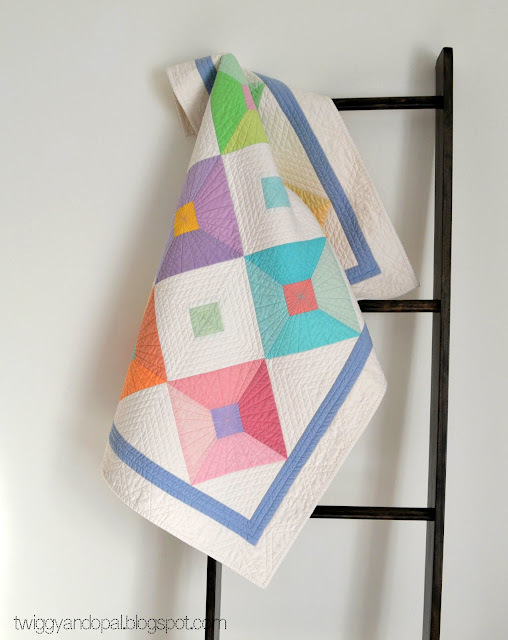 I took a design I made last year (Connections) for a Curated Quilt Challenge, and revamped it using bright jewel tone Peppered Cottons. I fully intended to stop right where it was, but something got to me and I felt the need to keep going. 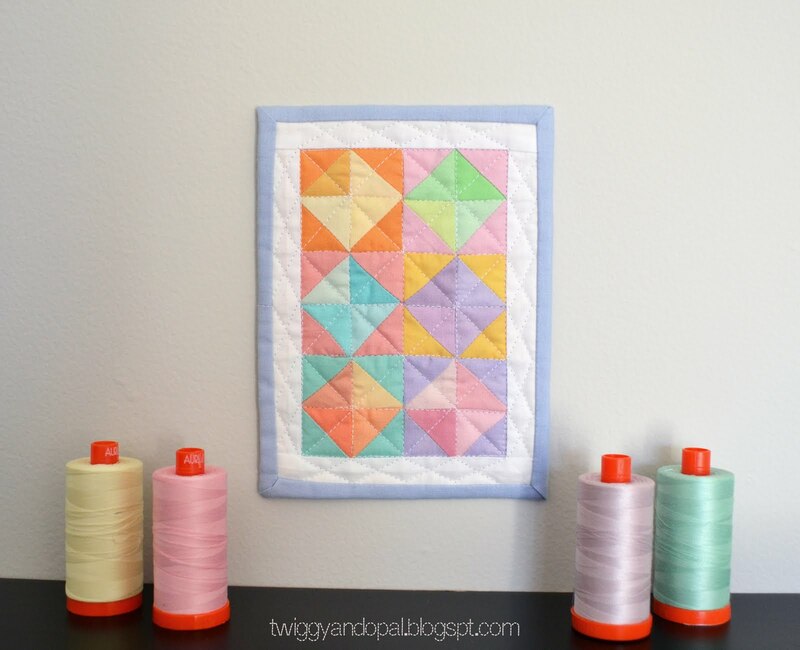 Story of our quilt life, right?! 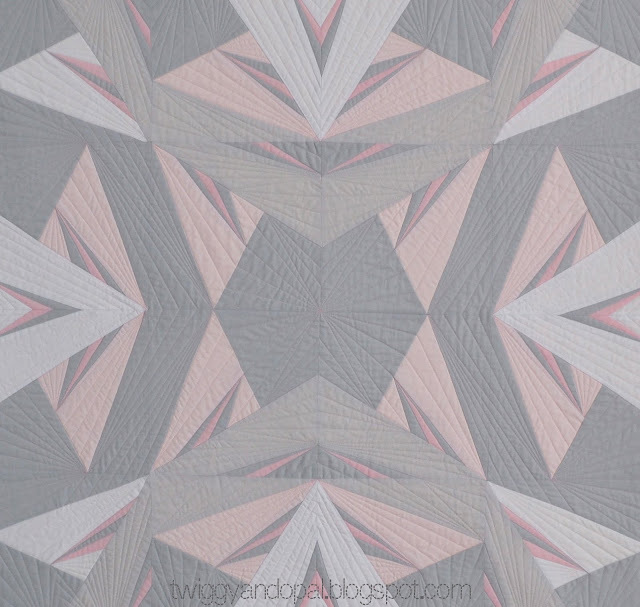 I've had this Studio E Peppered Cotton fabric for quite a while, and I figured it was about time I use them. 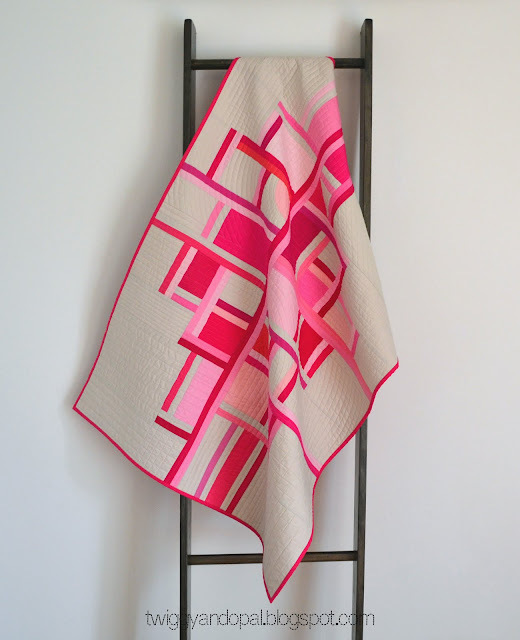 Plus, I wanted to make something with bold colors ever since I finished my pastel Pink Haze quilt. 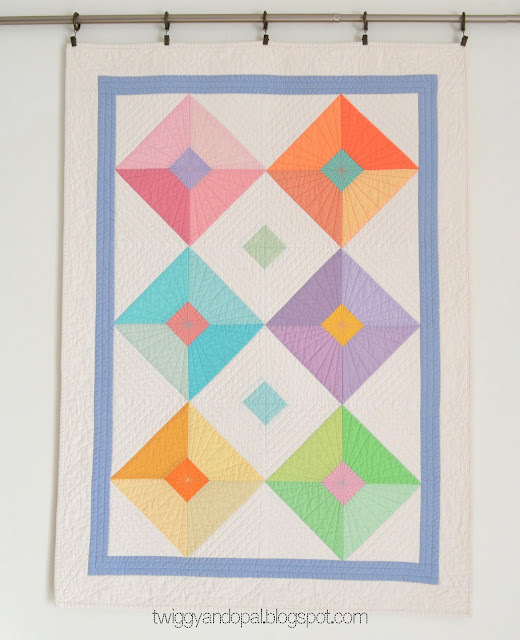 The blocks are a very simple paper pieced design. Three sections are all you need! 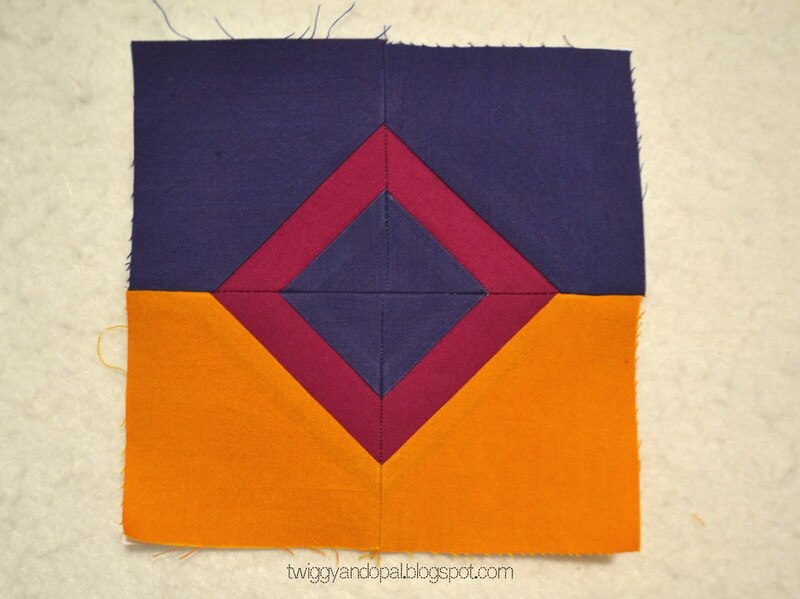 However, when four blocks are sewn together that's where the magic starts. 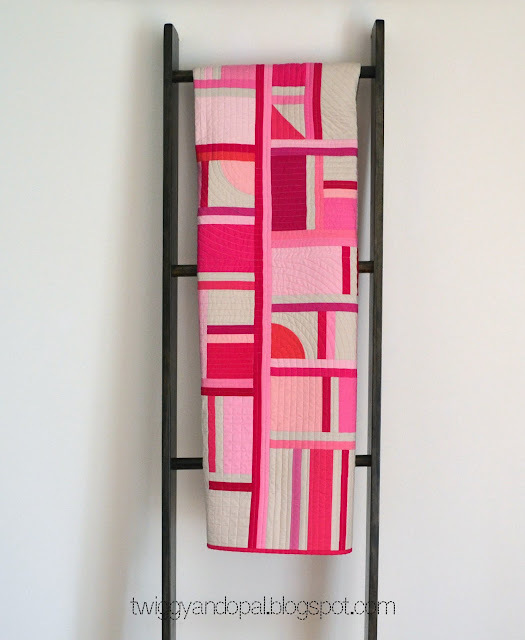 You can take it in many different directions depending on your color placement. Since this was suppose to be a simple small 'pick up' project, I played with the design and colors in EQ8 until I found one I liked. Even then, I had to change a color I choose in the original design. I was bound and determined to get every seam to line up, which was easier said than done! Using a large basting stitch (3.0) before sewing a 1/4" seam was used to ensure this would happen. 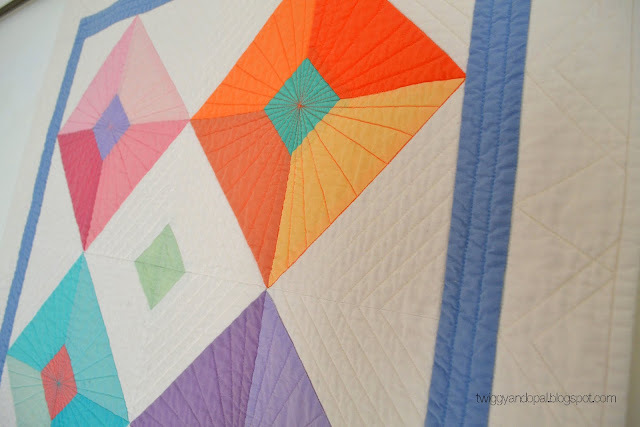 It helped, but I still had to get the seam ripper out and try a couple times on some of the blocks. Even though this was a project to fill time, I learned from previous projects that I would be very sad and dissatisfied if I didn't try for perfection! So I did my very best! And so I did. As I was cutting out the fabric for the new round, I had to change up some of the fabric selections. I pretty much used every stitch of my peppered cottons, which is a good thing. 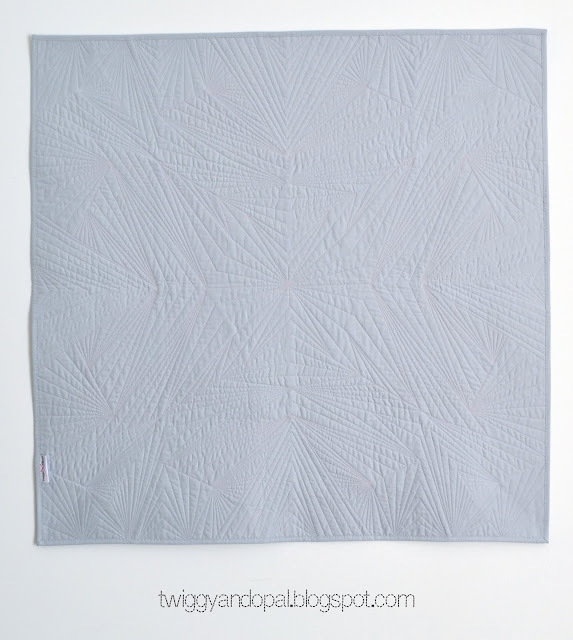 There is no way this quilt will get any larger, unless I add a border. After the final round it will be 36" x 36". s-t-r-e-t-c-h some of the fabric to make it work. 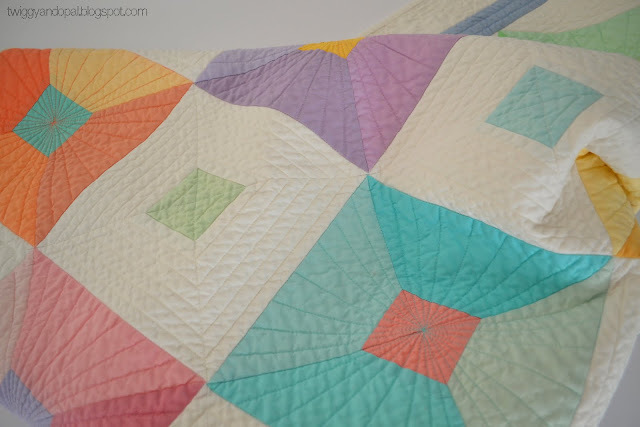 Otherwise I would seriously been short by 'just that much' and the quilt would have stalled! As it was I made it work and time will tell if it'll come together as planned! Today is QuiltCon!! My first time attending and I can't tell you how excited I am about that! I've only watched from afar, and now I get a front row seat to the festivities and hoopla! Plus, the real bonus is meeting many of the people I know only through Social Media. It's gonna be amazing! 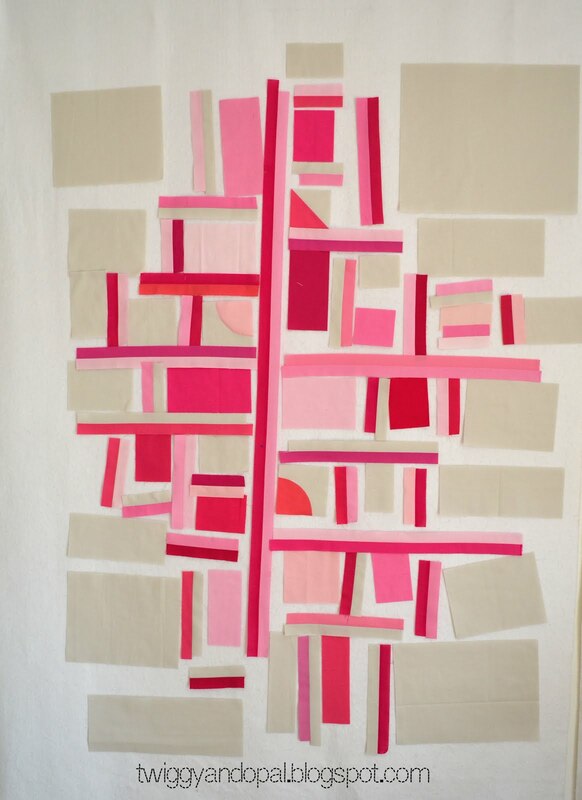 Of course, seeing all the beautiful quilts promises to be the cherry on top of the entire experience! 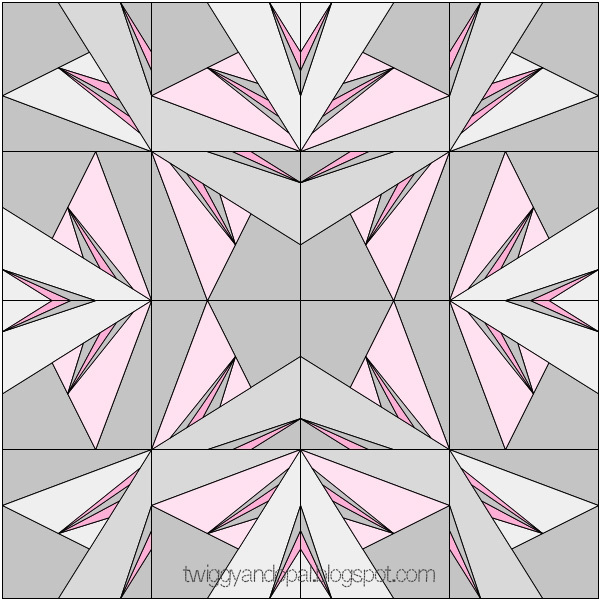 I'm going through a pink phase as this new version of Baby Geo will show. Pink was always an okay color throughout my life, but it wasn't until recently that it has become my favorite color. I'm not sure why that is. Maybe I'm reliving my childhood or finally getting in tough with my girlie side! 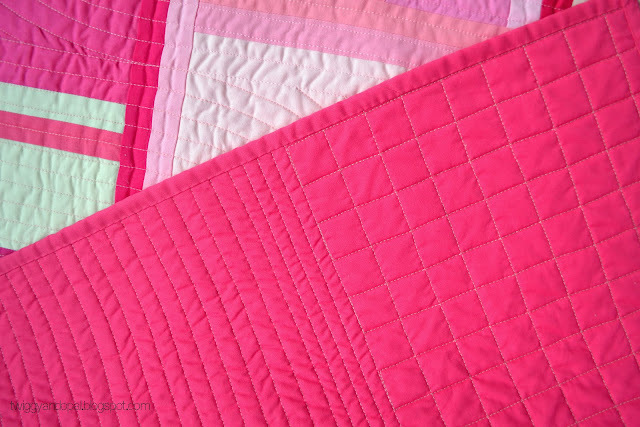 Whatever the case I couldn't resist the urge to make a very, very pink quilt. This is my third version of the design. 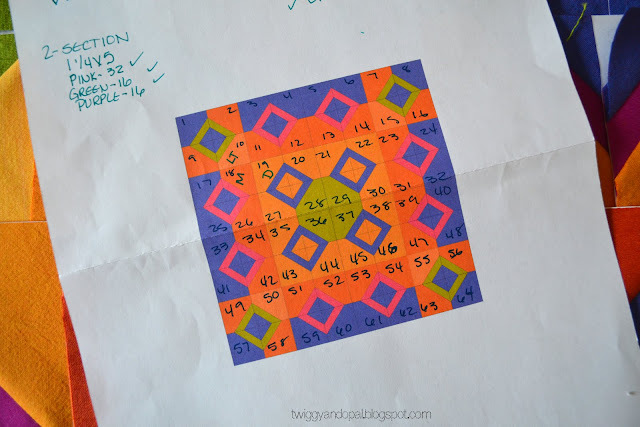 The first was Geometry Lesson, a lap quilt that got me started on the concept. I liked where it took me and decided to redesign it into a baby size version. In that design, I reduced and reconfigured the pieces for the same, yet different Baby Geo version. It is a lot of pink! A lot! The background is Kona Haze, although I'm not 100% certain, and it does a good job to neutralize the pink to some extent. At the time I wanted pink, pink and more pink. If I had taken the time and not jumped in so fast, I think I would have added more coral or peach shades. Next time?! 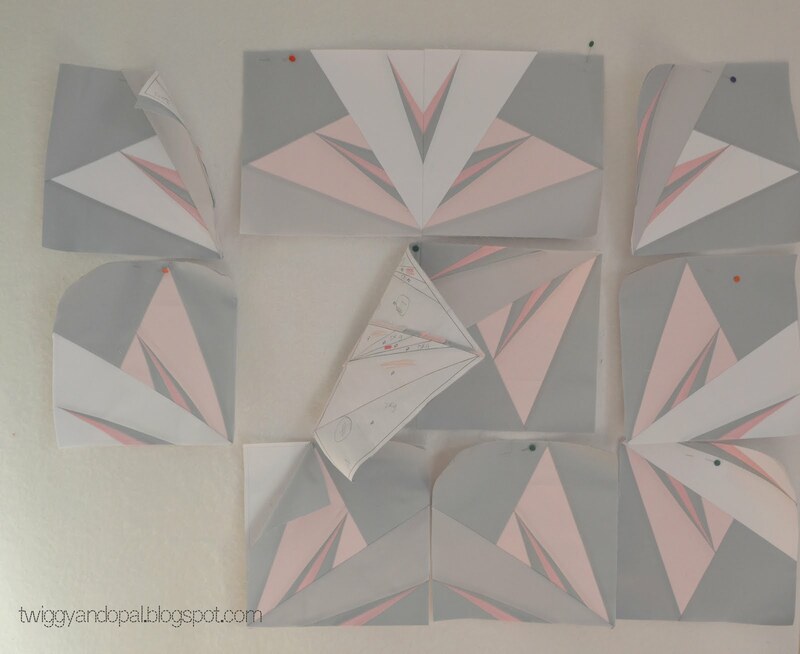 The truth is, it didn't look so electric when I had all the pieces on my design wall! What takes the most time is the cutting. 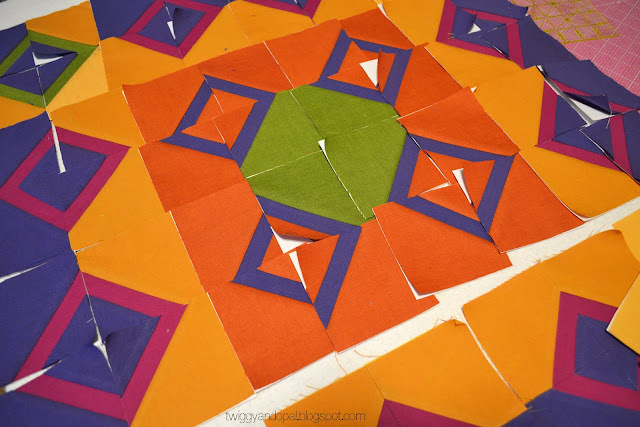 It would be one thing if I could mass cut the shapes, but each piece is a different color and the majority of pieces are different sizes. I'll cut a few blocks, stick them on the wall, cut a few more and repeat the process until I'm happy with the color placement. After which I'll cut the background pieces. 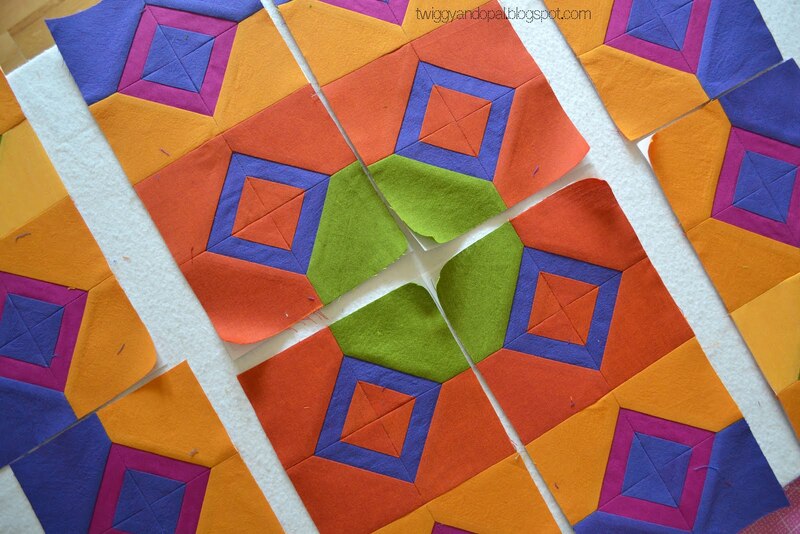 Once the cutting is finished, the piecing goes pretty quick. Which is very welcome at that point. I used Aurifil 50wt thread in Baby Pink (2423), Bright Pink (2425) and Light Strand (2000) for the quilting. I didn't need more bright pink at this point, but the shades are subtle and worked well with the background. You can tell it's pink if you are up close. Just as with the previous two quilts, I wanted to add a curved element. I used a marker and drew the first curve, and thereafter the side of the my foot gave me the 1/2" width between each line. After finishing the initial curve sections, I filled in with more 1/2" as well as 1/4" and 3/4" lines. I also added a couple grid areas for a bit more interest and texture. 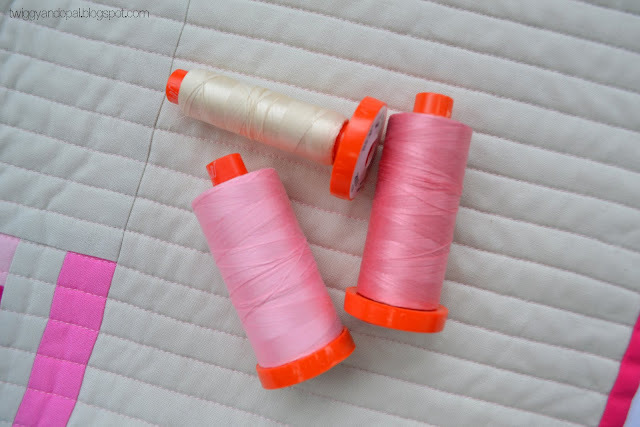 You can barely tell that the thread color is pink in this shot. It is just has I hoped it would look though! 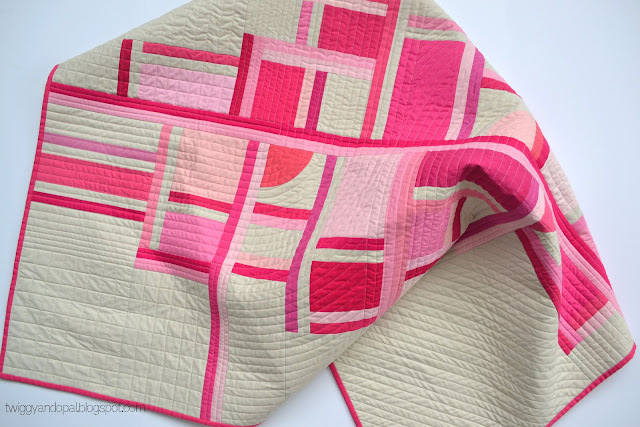 The binding and backing is Kona Honeysuckle, a beautiful bright pink that put the final finishing touch on this quilt. 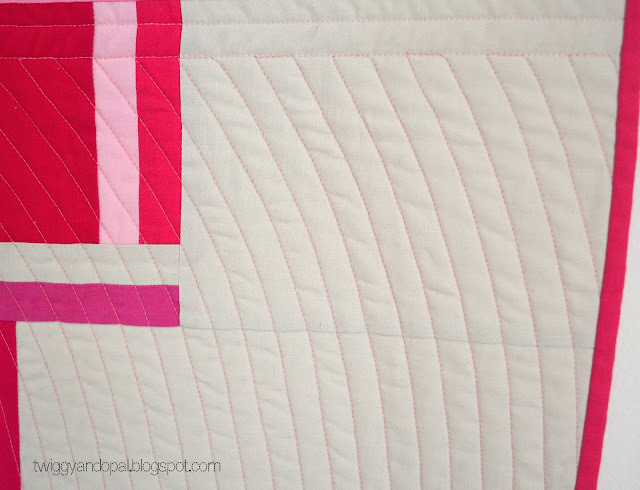 Sometimes at the end of a quilt I find that there are changes I wish I had made along the way. 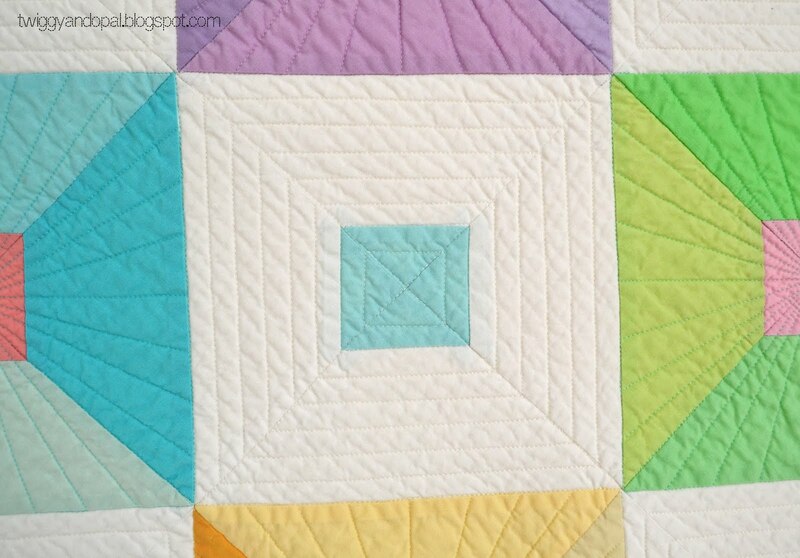 Small details usually, such as color, quilting or placement of blocks. I think we all feel that at some point. I remind myself there is always next time! 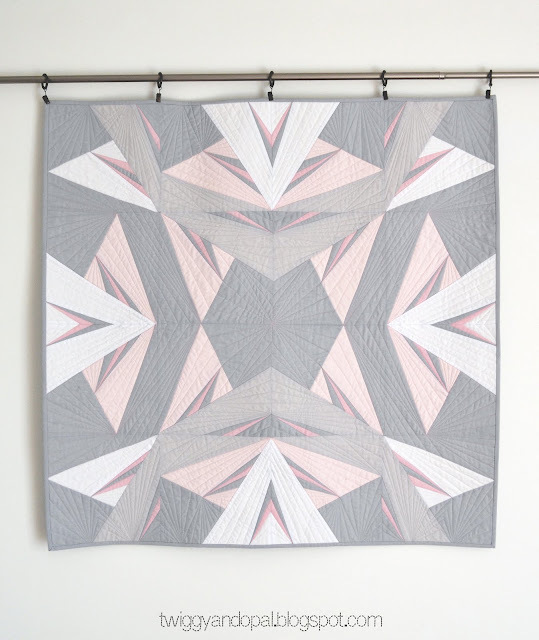 It's a treat for me to share this next quilt! 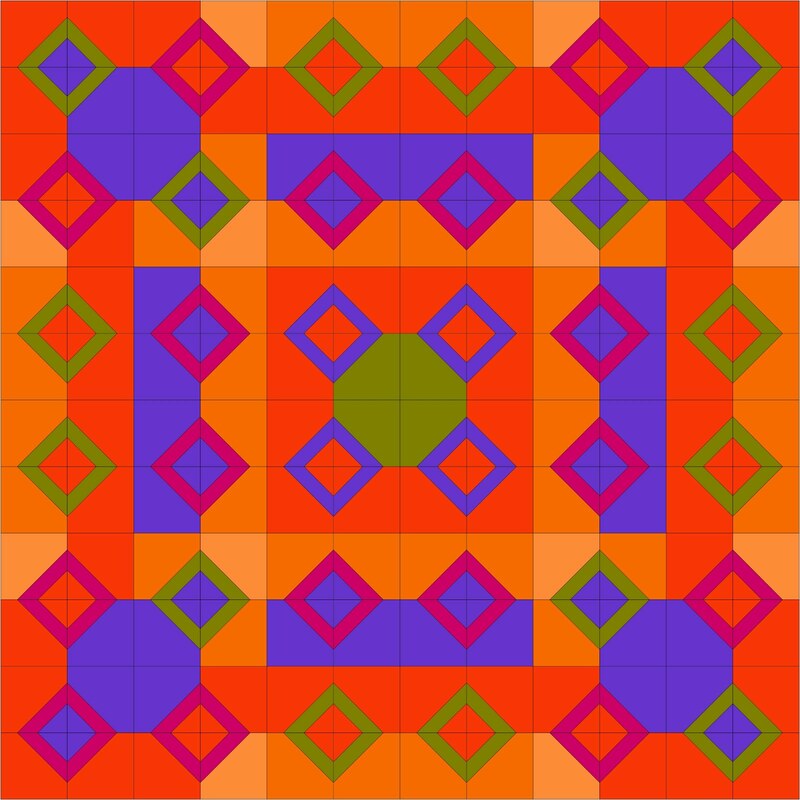 The design is one I've been entertaining myself with by changing the layout and colors, and always coming up with something new and interesting. 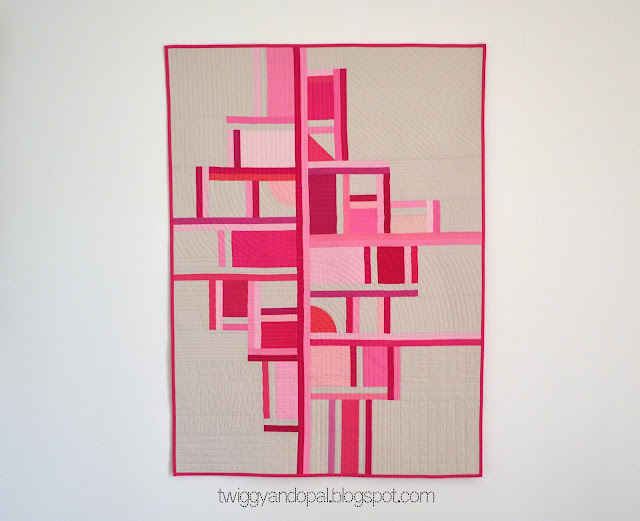 The fact that one block can be arranged in so many different ways, to me is simply amazing! 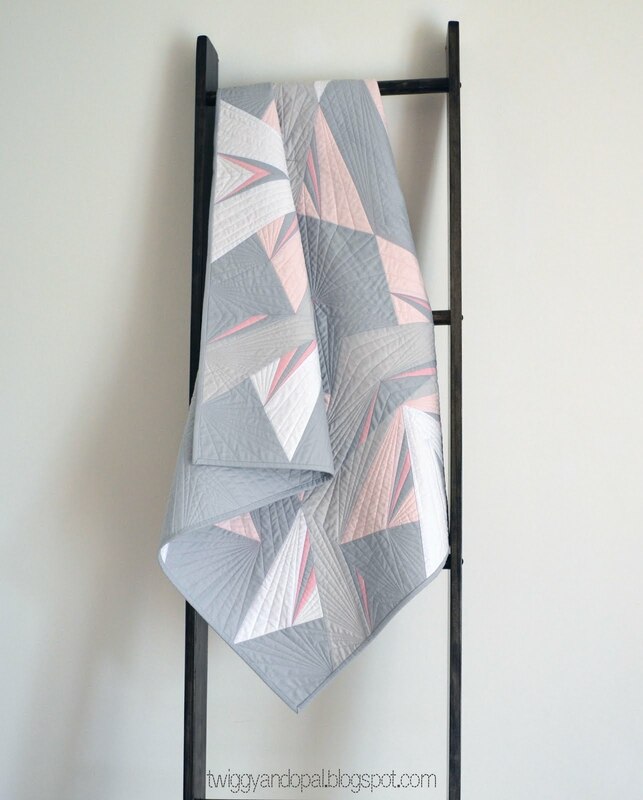 I usually don't lean towards soft muted colors, and I'm not even sure how this palette landed in my lap, but it did! I mulled it over before making a final decision on the next step which was size and fabric. Picking the right shade of colors was quite the challenge! There was a lot of back and forth with 'too dark, too light, too bright, too similar'. Eventually it all came together and I was ready to start putting my design idea to the test! The fabric I used is Kona Cotton in White, Quicksilver, Silver, Baby Pink and Ballet Slipper. The first Block Print quilt I made using this design was a dark gray and red combination and using 6" paper pieced blocks. 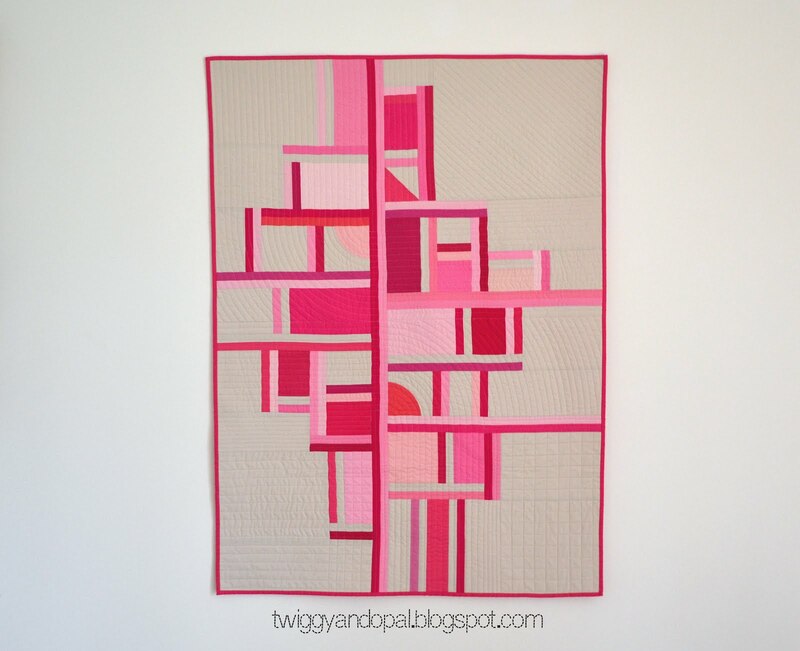 That quilt will be displayed at QuiltCon in Nashville in case you'd like to see it! 16 of 1A - white, 16 of 1B - light pink) The last step is pre-cutting the correct size for each section and the quantity needed. When I'm making the same block numerous times I usually sew the same section in each block and work through to the end. Much like chain piecing or assembly line style! 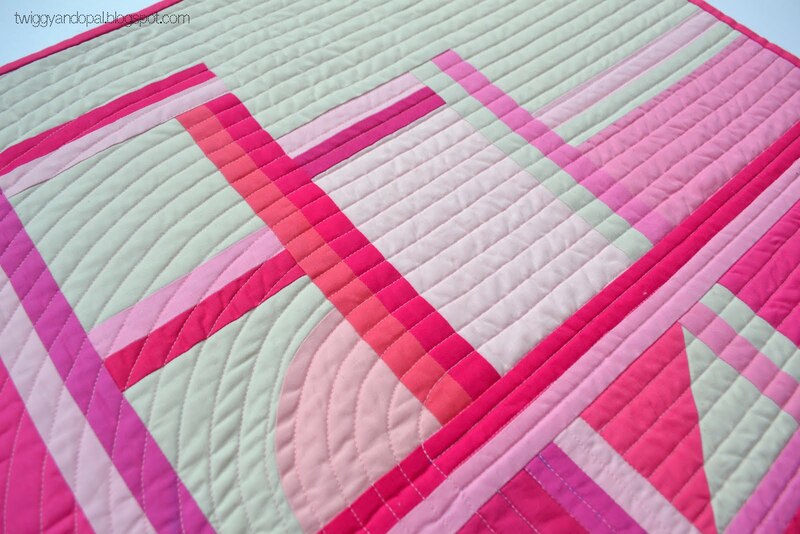 You know what the last step is...the dreaded quilting! 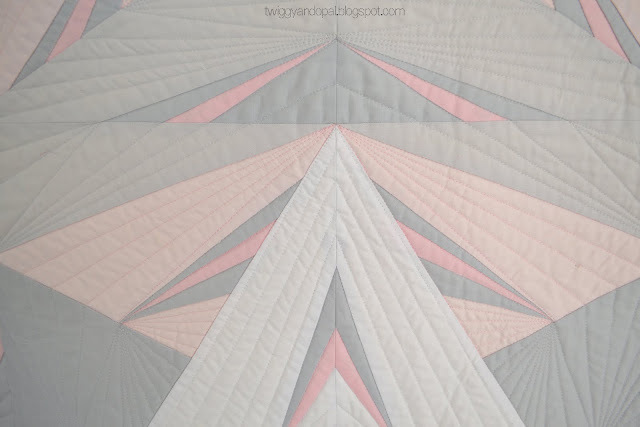 I knew I'd do some kind of geometric quilting so at least that part was settled. 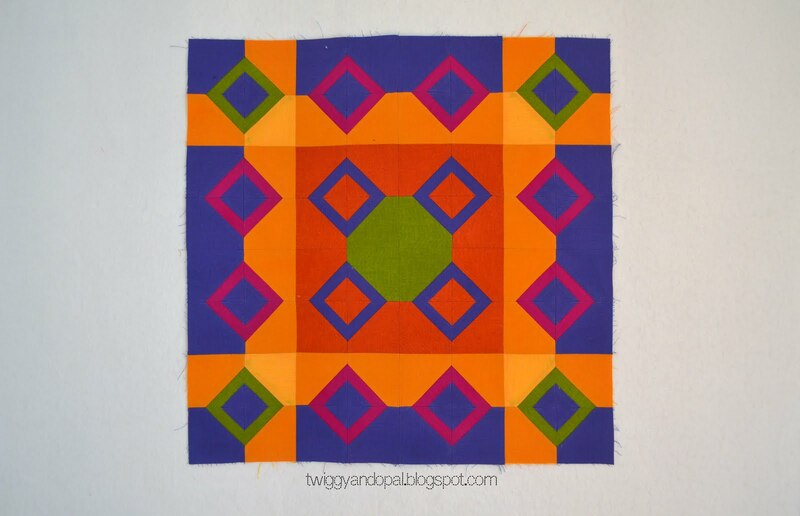 I printed the quilt on paper and attempted to plan out the design. I say attempted because it didn't work out quite as I had hoped it would! My hat is off to those who are able to preplan from start to finish their quilting designs! I ended up getting frustrated and gave up. What I've found that works best for me is quilting section by section. One step at a time. Eventually it all comes together, and so far that method has worked for me. Picking the right thread color is another important step. I used Aurifil 50wt thread in three colors. Dove #2600, White #2024 and Baby Pink #2423. 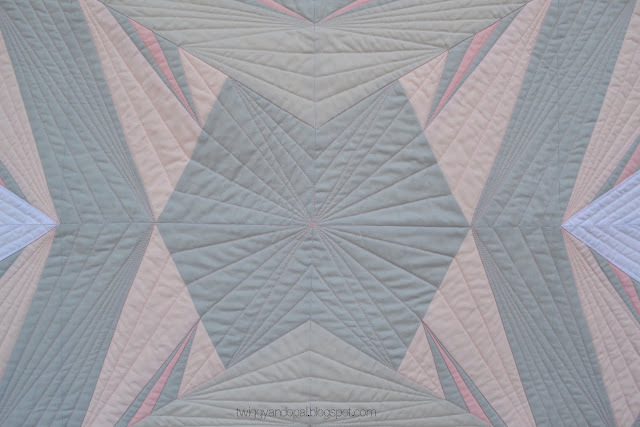 My only goal was not to have any gray or white thread in the pink sections, but pink did make it into the gray. It's subtle, but it's there! 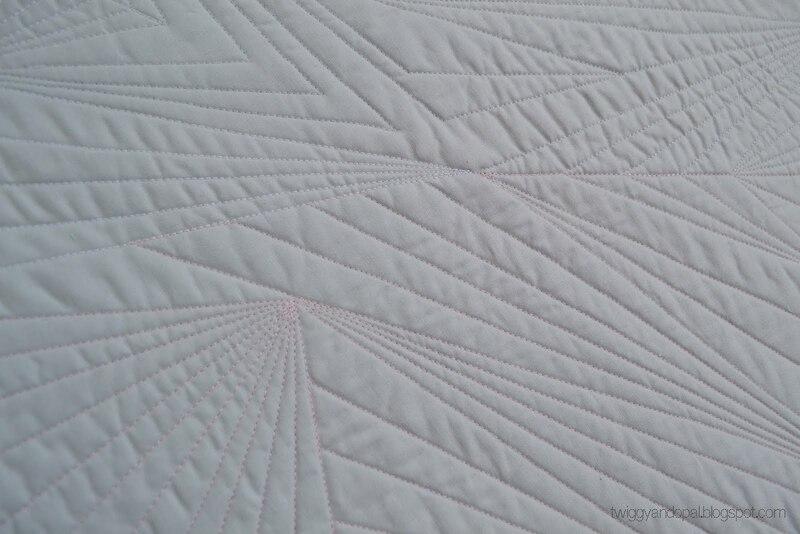 These pictures of the back illustrates the quilting and thread color a little better. Like I said, it's subtle! 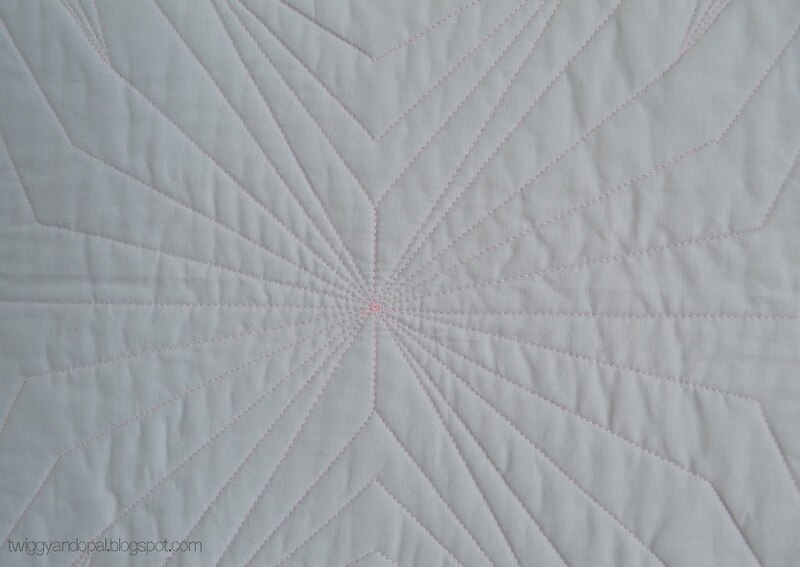 The larger picture of the quilting can be see from the back, at least somewhat. 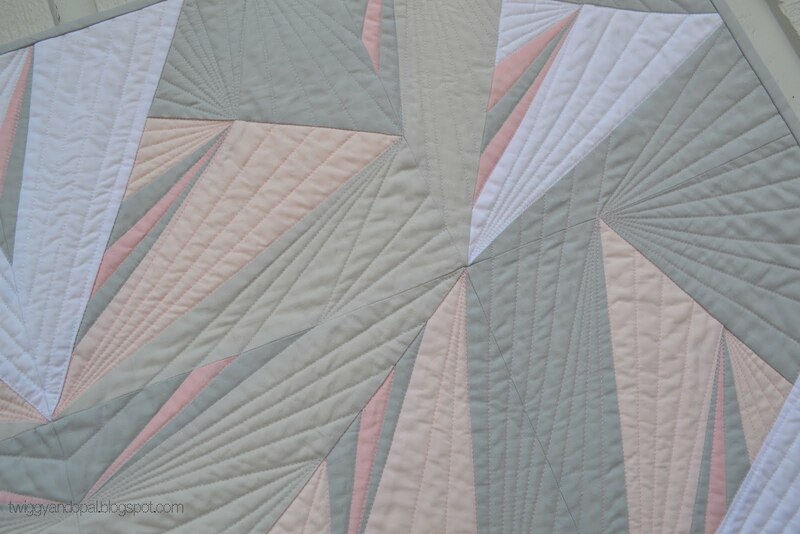 I don't know what it was about this quilt, but it was nearly impossible to get the accurate colors in the photos. I tried everything! Different locations, different times of the day! In the end I had to do the best I could. If you have any tips for photographing gray or pastel quilts I'd love to hear them! Hiring a professional photographer is not an option! Except for the colors, the top photo is the end result from the bottom EQ8 design below! It's always a sigh of relief when a vision becomes reality! I'm excited to make another version using the Block Print block! Ideas are never ending, having the time to do it is altogether another matter! First I have to wrestle with the nagging thought in the back of my head of 'when is enough enough'?! How many is too many of a design? !